I’ll never forget it because I was there to see it. Not the game itself, but rather a singular unexpected moment in the game that’s worth remembering forever. In a tense, 28-21 game still up for grabs, Ohio State quarterback J.T. Barrett ran for no gain to the OSU 33 on the first play of the fourth quarter. Then he lay flat on his back and didn’t move again until medical personnel reached him. For the first time since I’d entered the stadium several hours earlier, an eerie hush fell over the crowd as we saw Barrett lying prone, surrounded by medical folks crowding him and gesturing to the sidelines with non-verbals that said something more serious had occurred. 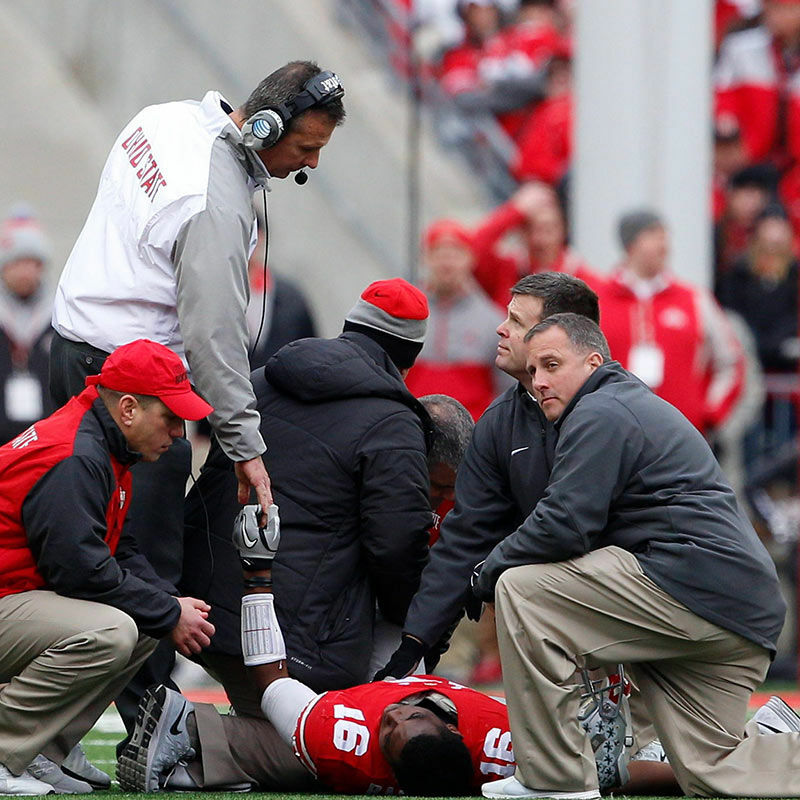 For OSU, and Heisman hopeful Barrett, it was indeed bad: season-ending broken ankle. With Barrett out, not only was the game itself now in jeopardy, but any chance of moving past the Big Ten Title Game and into the playoffs was almost certainly dashed. You could almost palpably feel a collective “It’s over” in the stadium, National Title hopes now wrapped in an aircast at the 33. 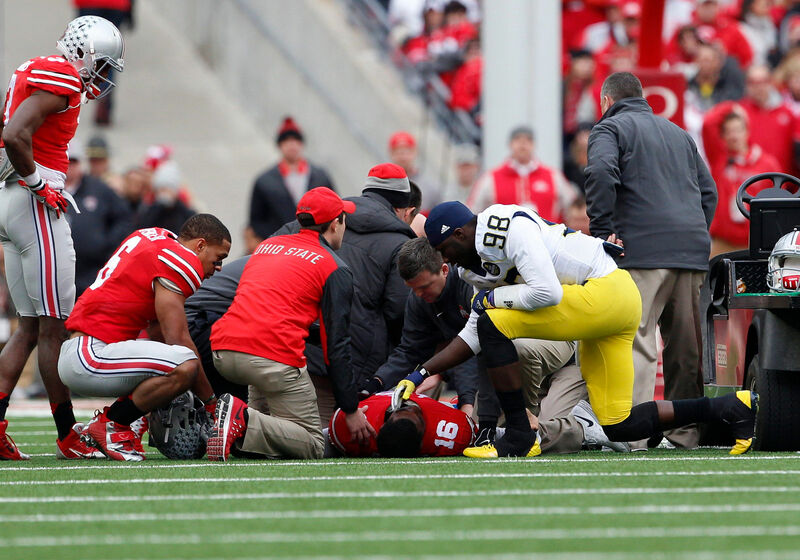 Michigan quarterback Devin Gardner ran out on the field from the opposite sideline, slid past multiple OSU trainers, and knelt down by Barrett’s side. Fans had been swearing, yelling, and screaming at Gardner all day. From the visitor’s section where I sat, even Michigan fans had been swearing, yelling, and screaming at him all day as they had all throughout his rocky, inconsistent Senior season. Not only does Gardner kneel down by him, but then he touches his face before grabbing his hand. Like he was his Dad. Or his best friend. Or the opposing quarterback of an arch-enemy trying to compete at a high-stress Division I university who understood and empathized with his counterpart better than anyone watching in person or on TV. Like he completely forgot about himself long enough to extend something completely out of place on this day in this stadium during this game. A manly, brotherly tenderness reserved for self-conscious parents walking their kids out on Senior Day but never on display at mid-field of a yet-to-be-decided game against your hated rival. Gardner extended a combination of phileo (friendship), storge (brotherly), and agape (unmerited) loves that never seem to find a place in the vocabulary of competitors and therefore rob us all of an aspect of competition as God intended it. Then he got up, ran back to the Michigan sideline without drawing any more attention to himself, and dissolved back into the sea of players and coaches to get ready for the next possession. What did it take for this guy to leave his own sideline, step in among opposing trainers, touch Barrett’s face, grab his hand, say something meaningful to him (“He told me to stay up...says he’s praying for me”), trot back into his sideline without fanfare, perhaps expecting to hear from Michigan faithful that “he should be concentrating on the game and not playing nurse to the other side” or some other criticism? Ohio State fans will remember the moment because it triggered the most improbable run to the National Championship imaginable, as little-used Cardale Jones came off the bench not only to finish the Michigan game, but also to beat Wisconsin, Alabama, and finally Oregon. But I’ll remember it for something almost impossible to experience in a normal game let alone a rivalry game. Devin Gardner’s display of courage, sportsmanship, and—here it is again—love for his rival, all of which seem even more improbable and harder to see in the world of sports these days than longshot wins by backup quarterbacks.